Pokhara—Pokhara Chamber of Commerce and Industry (PCCI) is marked its 65th anniversary. PCCI which is an umbrella organization of entrepreneurs and industrialists from Pokhara was established on February 7, 1955 in Lake City. Late Amrit Prasad Serchan was the founding chairman of that organization. PCCI former executive member and culturist Tirtha Shrestha said that the organization is not only the guardian of private sector but also the messenger of awareness in Pokharali society. According to him, PCCI has been working for economic, cultural and educational development of Pokhara for decades. Prithvi Narayan College, Pokhara University and Balmandir are some examples that were established in the funding and leadership of PCCI which is also a donor of various development projects in Pokhara. PCCI former chairman Krishna Mohan Shrestha claimed that the organization never forgot the part of social responsibility in its walk. On the occasion of its 65th anniversary, PCCI has hoisted its flag and commenced a training on Business Management. The five day long training has been joined by 26 entrepreneurs. Training organizer Industrial Entrepreneurship Development Foundation chief Ram Prasad Tiwari informed that the participants would learn about new technology, skill development, marketing and business extension during the training period. 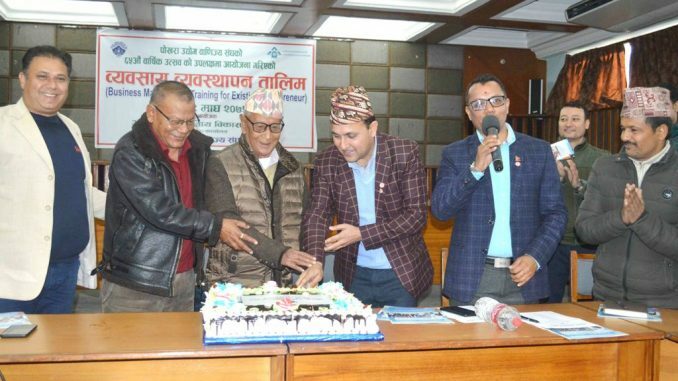 PCCI chairman Damu Adhikari said that the organization has a long history and there is no need to be distracted from that organization even if somebody spreads a whim of forming another such new organization. ” If someone forms another chamber after losing an election,” he further added that- such trend may seem in that organization too. PCCI senior vice chairman Narayan Koirala asked all the participants to gain more and more knowledges from the training. Meanwhile PCCI former chairman Bishwo Shankar Palikhe and general secretary Arjun Pokhara were present during the training inaugural.